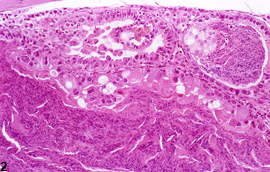 Hyperplasia of the rete testis epithelium occurs as a focal or multifocal lesion and can be seen as an occasional incidental lesion in rats but more commonly in CD1 mice. 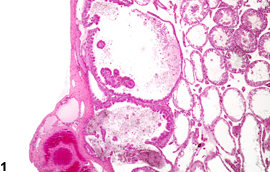 The hyperplastic epithelium generally forms papillary or knob-like projections into the lumen with no compression of surrounding tissue ( Figure 1 and Figure 2 ). The hyperplasia is frequently accompanied by cystic dilation of the rete ducts and sperm stasis ( Figure 2 ). Proliferative lesions of the rete testis have been observed in response to prenatal exposure to diethyl stilbestrol. The finding needs to be distinguished from rete testis adenoma, where extensive papillary structures and supporting stroma cause compression of the surrounding tissue. Rete testis hyperplasia should be diagnosed and graded whenever present. Bilateral involvement should be recorded when present. Associated lesions such as sperm stasis and seminiferous tubule dilation should not be diagnosed separately unless warranted by severity, but should be described in the pathology narrative. Bullock BC, Newbold RR, McLachlan JA. 1988. Lesions of testis and epididymis associated with prenatal diethylstilbestrol exposure. Environ Health Perspect 77:29-31. Frith CH, Ward JM. 1988. Color Atlas of Neoplastic and Non-neoplastic Lesions in Aging Mice. Elsevier, Amsterdam. Maekawa A, Hayashi Y. 1987. 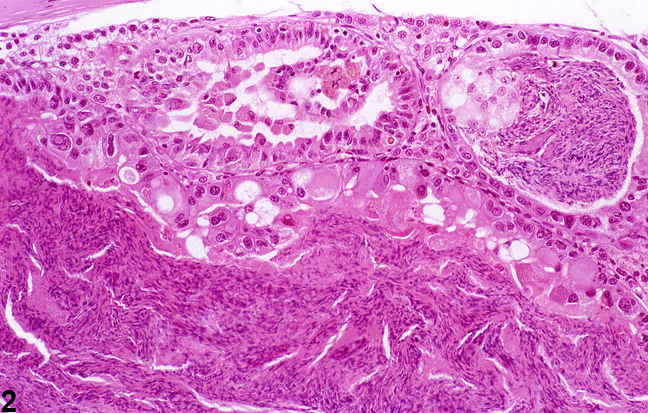 Adenomatous hyperplasia, rete testis, rat. In: Monographs on Pathology of Laboratory Animals: Genital System (Jones TC, Mohr U, Hunt RD, eds). Springer, Berlin, 234-236. Mitsumori K, Elwell MR 1988. Proliferative lesions in the male reproductive system of F344 rats and B6C3F1 mice: Incidence and classification. Environ Health Perspect 77:11-21. Rehm S, Harlemann J, Cary M, Creasy D, Ettlin R, Eustis S, Foley G, LeNet J, Maekawa A, Mitsumori K, McConnell RF, Reznik G. 2001. Male genital system. In: International Classification of Rodent Tumors: The Mouse (Mohr U, ed). Springer, Berlin, 163-210. Yoshitomi K, Morii S. 1984. Benign and malignant epithelial tumors of the rete testis in mice. Vet Pathol 21:300-303.